A Lime rider in Santa Monica, California, one of the first U.S. cities where e-scooters appeared. UCLA researchers have found that people involved in electric scooter accidents are sometimes injured badly enough — from fractures, dislocated joints and head injuries — to require treatment in an emergency department. The researchers examined data from 249 people who were treated at the emergency departments of UCLA Medical Center, Santa Monica, and Ronald Reagan UCLA Medical Center between Sept. 1, 2017, and Aug. 31, 2018. The study found that about one-third of them arrived by ambulance, an indication of the severity of their injuries. West Los Angeles is the epicenter of the electric scooter phenomenon — Santa Monica was one of the first U.S. cities in which the scooters were widely used — but the vehicles are now available in more than 60 cities nationwide and about a half dozen locations outside of the U.S.
“There are thousands of riders now using these scooters, so it’s more important than ever to understand their impact on public health,” said Dr. Tarak Trivedi, the study’s lead author, an emergency physician and scholar in the National Clinician Scholars Program at the David Geffen School of Medicine at UCLA. The research, published Jan. 25 in JAMA Network Open, is the first published study on injuries caused by electric scooters. It reports that the most common mechanisms of injury among scooter riders were falls (80 percent), collisions with objects (11 percent), or being struck by a moving vehicle such as a car, bicycle or other scooter (9 percent). About 92 percent (228) of the injured people were riders, and 8 percent (21) were non-riders, including pedestrians who were struck by scooter riders or who stumbled over a discarded scooter. About 4 percent (10) were documented to be wearing a protective helmet while riding their e-scooter. Patients fell into one of three injury categories: head injuries (40 percent), fractures (32 percent) and cuts, sprains or bruises without a fracture or head injury (28 percent). Fifteen people were admitted to the hospital, two of whom were treated in an intensive care unit. 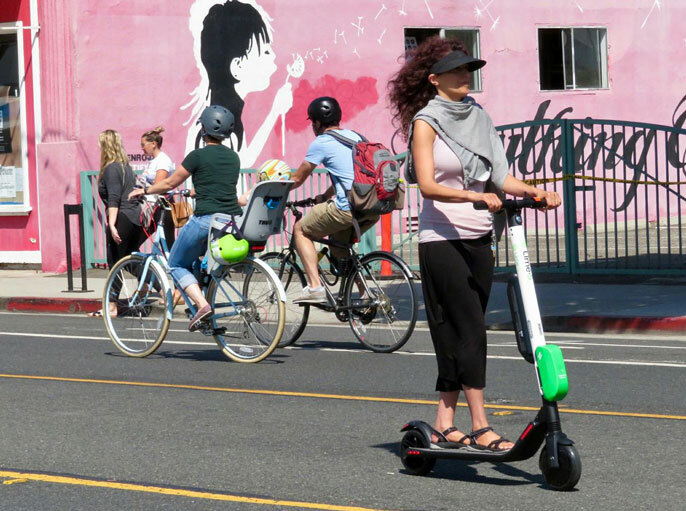 The researchers also observed e-scooter riders at various Los Angeles intersections for a total of seven hours in September 2018. About 94 percent of the 193 people they saw riding scooters were not wearing helmets. E-scooters can reach speeds of about 15 miles per hour, and it has become common to see them zipping along streets and sidewalks — even though they are intended to be used on streets only — often dodging pedestrians and motorists. Unused scooters are frequently left at the edge of curbs, but they sometimes are abandoned in places where they obstruct sidewalks or block building entrances. Scooter companies typically recommend that riders be at least 18 years old and wear helmets, although riders often flout those guidelines. And in January 2019, a new California law eliminated the helmet requirement for e-scooter riders 18 and older. The authors noted some limitations of the study. The researchers were limited to the data available in electronic medical records, so information on certain variables — like whether riders were wearing helmets at the time of their injuries — was not always available. They excluded data on 74 emergency department visits that were suspected to be scooter-related but lacked sufficient documentation. They also could not evaluate the role that urban planning and infrastructure might play, for example the influences of speed limits and the availability of dedicated bicycle lanes. The authors wrote that the Segway, a two-wheeled personal transporter that was introduced in the early 2000s, and a precursor of the scooters, also carried a serious risk for orthopedic and neurologic injuries. The study was funded by the UCLA National Clinician Scholars Program and the VA Office of Academic Affiliations through the VA/National Clinician Scholars Program. The study’s co-authors are Dr. Charles Liu, Anna Liza Antonio, Dr. Natasha Wheaton, Dr. Vanessa Kreger, Dr. Anna Yap and Dr. David Schriger, all of UCLA.